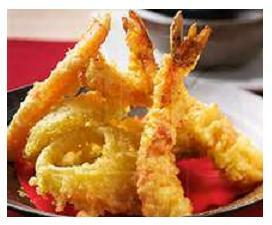 This page links to many Easy Party Appetizers, starting with the popular Tempura recipe shown below. About a dozen fresh jumbo shrimp, peeled and deveined. One or two extra large onions, separated into rings. 1 large head of cauliflower, cut into florets. 1 large sweet potato, peeled and sliced into pieces 1/2 inch thick. Rinse shrimp and vegetables under cold water, and pat dry with paper towels. Set aside. Put vegetable oil in a wok or deep skillet over a medium-high heat. Prepare a box of tempura batter, following the easy directions shown on the box. (Packaged tempura batter is surprisingly good. No need to make it fresh). Preparation merely involves combining the dry mix with the recommended amount of COLD water. To ensure that the water is cold, use slightly less water than the directions suggest, and add ice cubes to make up the difference. Mix batter well with a fork. Mixture will be lumpy. Lay out a few paper towels to place the cooked pieces on. One by one, grab the end of each large piece with a pair of tongs and submerge it completely into the batter mix. Remove each piece from the mix and hold it over the bowl so the excess batter drips off. Place each battered piece carefully into the heated oil and cook for two or three minutes. Turn the pieces over and cook for another two minutes. Remove the pieces from the oil, and place them onto the paper towels. To prepare the peas: In a small bowl, mix 1/2 cup of batter with 1/2 cup of peas. Drop the stiffened mixture by the tablespoonful into the heated oil. When done, remove gently with tongs. Arrange the finished pieces around the edge of a serving platter, and place a small bowl of tempura dip in the center. To prepare the dipping sauce, simply combine equal parts mirin and soy sauce in a small dish. Add one tablespoon of sugar per cup of dipping sauce. Tempura is one of America's favorite Easy Party Appetizers.